Think you’re not getting old? 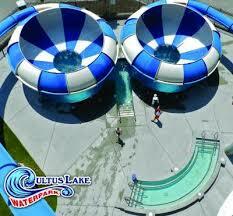 Try a day at the waterslides. Or half a day. 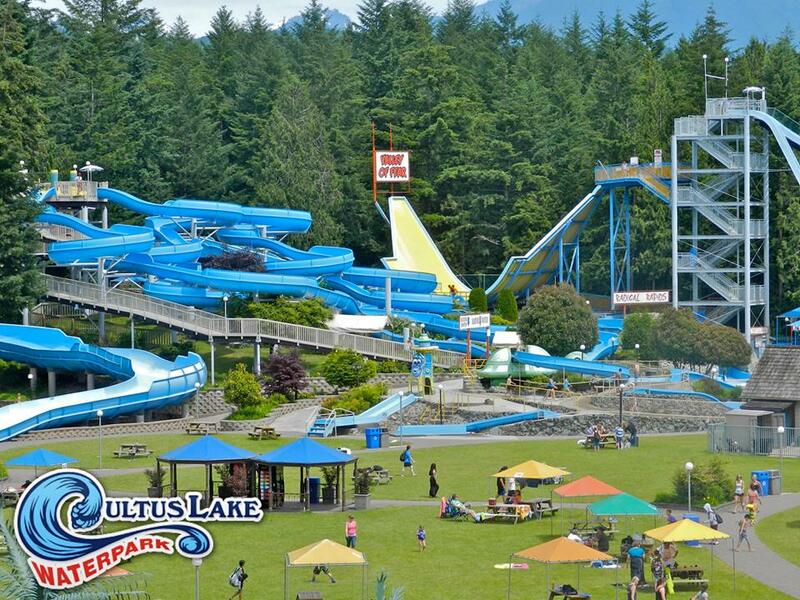 In an effort to make the summer of 2015, the bestestest summer of all time, we embarked on a day at the water park. Cultus Lake to be precise. It was a perfect day for it. Hot and sunny. We planned a later visit, (3ish), to avoid some of the crowds, you know, after a lot of the morning keeners had gone home, yet not so late that we’d miss out on all the rides. It was a bit of a drive, but not as bad as we thought. It’s the amazing thing about living in Vancouver. You’re never really that far away from anything. Plus, it was my first time at the park. Again, it’s one of those things you just don’t do when you’re by yourself. Like watching a kiddy movie in a theater. Or hanging a picture. But, hey, it looked like fun and the boys were super keen. So, the waterpark it was. No one told me 5 critical things, though. Every ride that involves some form of splashdown requires you to climb about a billion steps. Oh sure, the first ride you’re so keen you run up those steps, but after 2 hours of stepmastering up and up and up, I’d give a kidney for an elevator. As wet and cool as the rides are, standing in a line in the heat of the day can be draining. And standing in the heat after I’ve nearly coughed out a lung climbing the stairs nearly killed me. There are bugs. Seems the damn things are everywhere. Why can’t they stop bugs from getting in? I want someone to invent a bug-free park. Disney, hello, I’m talking to you. You will get water up your nose in a big way. Like someone used a colonic tube, shoved it up your nose and then turned on the water full blast. It makes me sneeze a lot and walk around like I was constantly smelling something bad (hey, maybe they did use a colonic tube?) Worse, unlike a good colonic, it doesn’t even make me poop better. Not that any of those things really made the day bad. Exhausting, yes, but not bad. The boys loved pretty much every ride, but they played in the waterpark part the most, splashing each other (and other kids), running around (on a slippery surface without helmets! ), and climbing up and down all manner of slides and ladders. Just goes to show ya, you don’t need a 1000′ slide into a pool to have fun. All of us had great fun zipping through tunnels and cannon-balling into the pool, or riding a raft down some chute that threatened to pitch us all over the side. Me? I loved the rides we could do as a family, all of us in it together, screaming, laughing, getting wet. Well, no, but here’s something I never knew about before I had kids – you worry about THEM. I honestly didn’t once fear that I’d be vaulted over the edge and split my head open like a well thrown water balloon. Hell, I didn’t care if that happened. But with the boys, especially the Youngest, I looked at every ride like someone who had to insure the place. Could they get hit as they spluttered in the pool by some big oaf who came rocketing out of a ride? What if they lose their grip and are flung off the side of the tube, and they are taken by pterodactyls that have escaped from Jurassic Park? So, adding to the heat, the stairs and hot dogs that cost as much as a small car, I worried about all the what ifs. But you know what? They were fine. They had a blast. 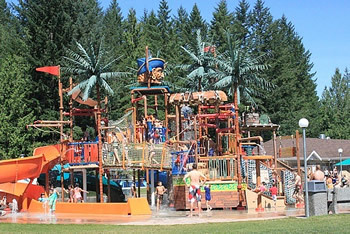 Anyone else had a great water park experience? This entry was posted in Blogging, Parenting, Stepdad, Travel, writing and tagged chutes, cultus lake, Disney, disney rides, humor, humour, parenting, slides, step-dad, stepdad, stepdaddy, stepdaddying, stepmaster, the oldest, the prettiest-girl-in-the-world, Traveling with children, Traveling with kids, water park, waterslides. Bookmark the permalink.